Oakkar7 shows you how to make an awesome DIY musical keyboard using only 7400 logic. 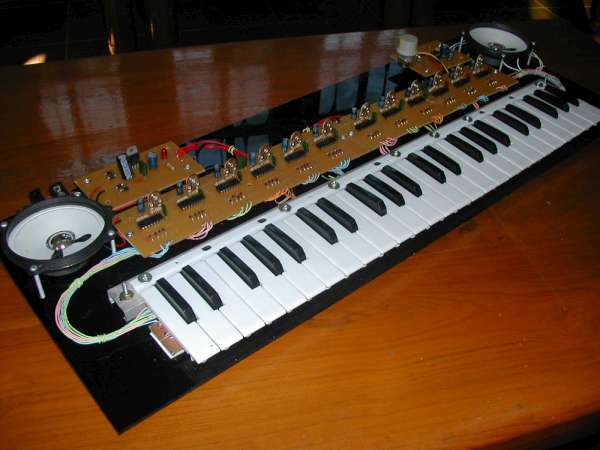 The idea is to design and construct an electronic musical keyboard with some functions, effects etc,. This is my old school project and I remake and modified it. It is fun. This entry was posted on Friday, November 2nd, 2012 at 7:00 am	and is filed under 7400 contest, contest. You can follow any responses to this entry through the RSS 2.0 feed. You can skip to the end and leave a response. Pinging is currently not allowed. yes, every musical instrument is basically tone generator. At least 12 tones generators are required for 12 pitches, C,C#…A#,B (ie: 12 freqs) for such devices. – required only 12 x 4060 ckts for 84 keys. I only used 48 keys because I have only 48 salvaged keys. If I use other oscillators (without uC), 48 tone generators will be required. I have to add more effects and control ckts soon. BTW, your Constant Load with Nixie Readouts is more awesome than mine. one of the nicest builds of the ones I’ve seen posted. Do you have any video showing this device in action? Here is the device in action video link.